Raynaud’s phenomenon is reversible vascular disturbance manifested as colour changes in fingers and toes. The colour changes (white, blue and then red) may occur in response to the cold exposure or emotional stress. Sometimes, Raynaud’s phenomenon presents as white or blue colour changes only. 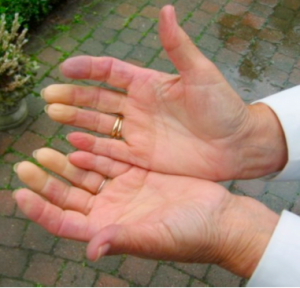 Raynaud’s phenomenon is divided to primary and secondary (related to other conditions). Secondary Raynaud’s phenomenon can be associated with rheumatic conditions (ex., lupus, scleroderma, vasculitis, rheumatoid arthritis), medications, blockage of the vessels, carpal tunnel syndrome, trauma, infections, use of vibration tools, etc. 1. Keeping hands and body warm (wearing gloves at all times, using exothermic reaction bags, or soaking hands in warm water). 3. Use of medications (ex., nifedipine). 4. Severe cases of the secondary Raynaud’s phenomenon complicated by ulcerations sometimes are managed in the hospital with IV medications. Warm the body, hands and feet gently (the skin may be numb and unable to feel if the heat source is too hot); use gentle arm movements or gentle massage to help restore circulation. Capillaroscopy is an in-office test that help to distinguish benign form of Raynaud’s phenomenon from one related to scleroderma or other connective tissue diseases. During the test, the skin at the base of the fingernail is examined under the microscope. Tiny blood vessels (capillaries) near the nail fold that are enlarged or deformed may indicate an underlying disease. 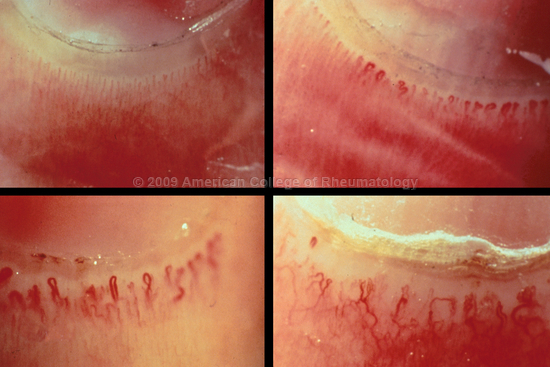 The top picture on the left shows normal capillaroscopy.